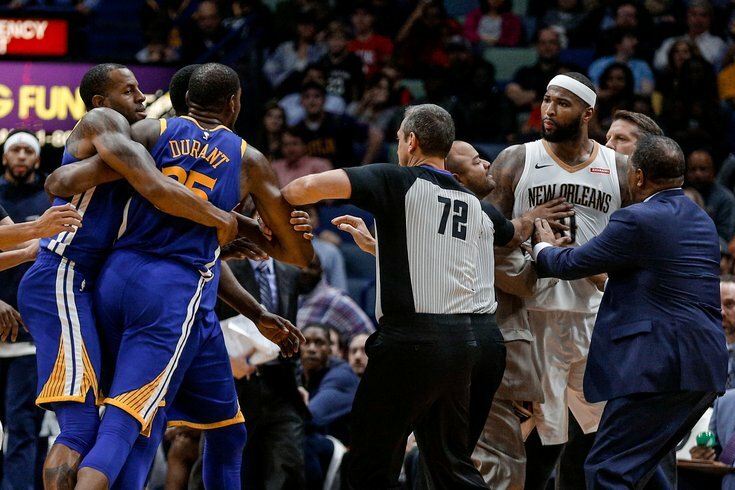 Cutting some slack: Does DeMarcus Cousins to the Warriors ruin the NBA? DeMarcus Cousins completes perhaps the best starting five in NBA history. In the midst of Twitter watching, as the NBA free agency landscape continues to unfurl, PhillyVoice.com's sports writers Evan Macy and Matt Mullin engaged in the following heated exchange over Slack just minutes after news broke of DeMarcus Cousins' deal to play for the Warriors. Evan Macy: This can't be real. Matt Mullin: Sure looks real. Evan: For what, the league minimum? Matt: I don't know, with all the exceptions and crap that are out there but I trust Shams. Evan: It's one-year, $5.3 million. Is this just NBA2K now? Matt: People used to complain that players only cared about money. Now when they care more about winning, and are willing to lose money to give themselves a better chance at a title, that’s a bad thing? Evan: You're in support of this? It's an abuse of the mid-level exception. He's worth at least five times that. Matt: I’m in support of the player being able to do what they want. Evan: It completely convolutes the entire economic system of the NBA. Not when he's turning down five times as much money from every other team. Like why have a salary cap at all? Boogie, Draymond, KD, Klay, Steph... five literal All Stars. Matt: He’s a “free” agent and should be allowed to sign where he wants for however much he wants. Evan: The cap was meant to PREVENT this. Matt: No, it was meant to prevent teams with more revenue from outbidding poorer teams on free agents. If players want to take less, you can’t prevent that. Evan: It's like an unwritten rule though. Like there has to be an economic system. Look at the idiot contracts guys are signing. He's making less than half Redick is... Markets exist for a reason. If this happened in the US with some other kind of good or service it would collapse the system. Matt: So who do you blame, specifically? The team? The player? Evan: It's funny, I don't see a remedy for it. But it's absolutely wrong. Like, why doesn't every Eagles player play for half their salary? And then they can stay together and win? It's just this unspoken thing... Players get paid for value. Matt: There are countless examples of guys taking pay cuts so teams can afford more guys. Tom Brady’s been doing it for years. Evan: Yes, Tom Brady did it. But this is a fraction of Boogie's value. Matt: LeBron and Bosh did it in Miami. Evan: Not a few million. It's like $25 million less than he's worth. He's taking a 500 percent pay cut... and in his prime. Matt: I don’t understand why you’re so worked up over this. He should be allowed to do whatever he damn well pleases. Evan: I just hate the precedent. The Warriors starters are arguably better than the all star teams of the 29 other teams. That's a post. Pick five guys who'd beat the Warriors. Who do I blame? I blame circumstance. But honestly, this is so counter to the point of the NBA. 90 percent of teams have to fight and claw and shift money to open up max space... But then the Warriors just squeeze in a top 3 NBA center through the back door. Many will complain the @warriors keep collecting All-Stars to maintain an unfair advantage and make the @NBA season a fait accompli, but they’re smart and aggressive and never rest on a single laurel, which is beyond commendable. That said, next year is moot. And it’s July 2. Matt: I mean, I haven’t looked at Twitter since the news so I don't know what the reaction is but I’m not mad about it. Like, I hope the NBA will still be somewhat competitive but I love guys putting winning and being in a good environment over money. Evan: Like 39 year old Karl Malone doing it is cool. But 27 year old Boogie is just outrageous. Evan: Well his value wasn't max deal. My point was... Mid level is for David West or whatever. It's unprecedented that at the peak of career you are taking that pay cut. And it's bad. I see repercussions all over the league from this down the line. Evan: True true. Though what you said is also true don't know how to police this.